Two-hundred wins across NASCAR’s three national series. An eye-popping number that only one driver in NASCAR history had accomplished previously. But NASCAR’s “King” now has company in the exclusive club in which he had formerly been the only member. 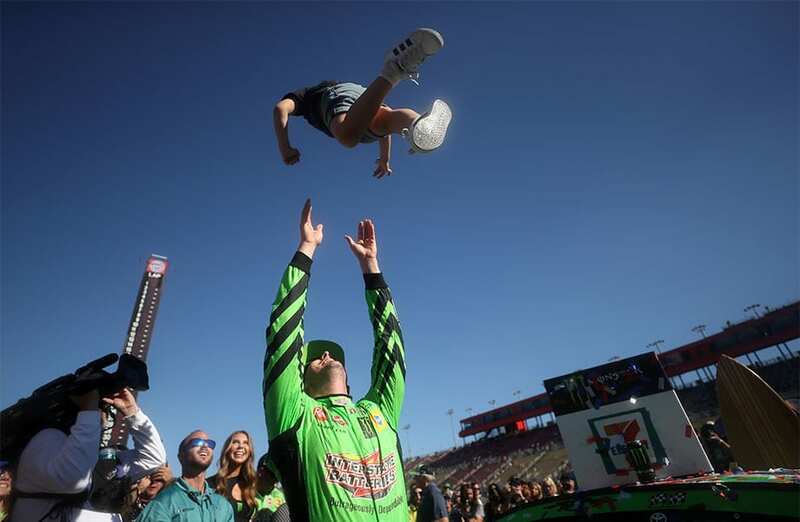 On Sunday, Kyle Busch joined Richard Petty as the only drivers to have 200 national series victories, earning his membership after winning the Monster Energy Cup Series race at Auto Club Speedway. Busch’s most recent win was his 53rd checkered flag in the Monster Energy Series, to go along with 94 Xfinity Series wins and 53 Gander Outdoors Truck Series wins. How Busch reached this mark was a winding journey with a multitude of highlights, plenty of bows, even more soundbites … and accompanied with a few low moments as well. To get a better understanding of the events that culminated with “Rowdy” scoring his 200th win, NASCAR.com spoke to several crew chiefs who have worked — and won — with Busch through the years. When team owner Rick Hendrick promoted Busch to the Monster Energy Series full time in 2005, he didn’t pair the then-20-year-old driver with a veteran crew chief who could help navigate the transition to competing in NASCAR’s premier division. Instead, it was 29-year-old Alan Gustafson getting the nod to lead the No. 5 Hendrick Motorsports team. I don’t know if I’ve ever seen anyone have the ability to go as fast as he can. Although Gustafson had never been a Cup crew chief, he was held in high regard within the Hendrick organization having worked his way up from being shock specialist in 2000 to lead engineer in 2002 before landing this plum assignment. The idea was that the first-year driver and first-year crew chief would grow together and learn the ins and outs of the Cup Series, eventually maturing into a formidable duo comparable to how Rick Hendrick had previously teamed Ray Evernham with Jeff Gordon and Chad Knaus with Jimmie Johnson. Like many before him, Gustafson was impressed with Busch’s talent, albeit still raw. That ability, Gustafson says, was evident the moment Busch first turned a lap in the No. 5 Chevrolet. Whatever “it” is that separates the great drivers from everyone else, Gustafson knew that Busch had it. Busch found himself in an enviable position that year, an opportunity any young driver would covet. But being with an organization awash in resources also brought heightened expectations where if a driver didn’t perform, it likely was because of his own shortcomings. That pressure is something young drivers can struggle to handle deftly. It was something Busch struggled with at times during his three seasons at Hendrick. Although his tenure could be deemed successful — four total wins and two Playoff berths — there were some rocky moments that created stress within the organization. There would be no championship for the Busch-Gustafson union, though they did have moments where it became apparent that if Busch had stayed at Hendrick Motorsports a title was likely in the future. Busch’s time with Hendrick ended when the organization signed Dale Earnhardt Jr. for the 2008 season and, needing to clear a spot on its roster, Hendrick elected to release Busch. That decision was announced during the middle of the 2007 season, and in the ensuing months the underlying tension that had been bubbling between Busch and his high-profile Hendrick teammates played out publicly. But it is not how Busch’s relationship with Hendrick dissolved that Gustafson remembers from his three years as Busch’s crew chief. He looks back now and fondly recalls how he and Busch were both new at their jobs, not just trying to learn how to swim, but learning to do so in the deep end of the NASCAR pool. One memory that Gustafson often recalls with great fondness is when he, Busch and some crew members decided to go on a scavenger hunt after a test session at Indianapolis Motor Speedway, looking for bricks from the track’s original surface to have as keepsakes. Except when it was time to leave they discovered the gate to exit had been locked. Taking it upon himself to get his team out of the track, Busch proceeded to drive their rental car along the golf-kart path inside IMS, including over a small bridge not designed for a vehicle of that size. Eventually, they made it out of the track. Gustafson still has a brick from that excursion sitting on his mantle at home. Earnhardt’s arrival at Hendrick forced Busch to pursue opportunities elsewhere, ultimately signing with Joe Gibbs Racing to drive its No. 18 Toyota. Expectations were high. That fire inside of them, you can’t teach that. The first impression Busch made with his new employer wasn’t all that different from how he had captured Gustafson’s attention at Hendrick. It made a lasting impression on his crew chief, Steve Addington. Seemingly motivated by his unceremonious exit from Hendrick, Busch came into 2008 like he had something to prove. During the regular season, he won eight races, earned the most points and led more than 1,000 laps for the first time in career. It was a breakout, star-making performance that delivered upon the hype that accompanied his arrival into NASCAR’s premier series three years before. Even though it appeared as if it would for much of the season, a championship celebration didn’t punctuate Busch’s first season with JGR. Three consecutive subpar finishes to begin the Playoffs left him in a points hole from which he could never recover — a frustrating stretch that came to symbolize how Busch fell short in the postseason during his early JGR years. The Busch-Addington combination came to an end the following fall when JGR split the two amid a 2009 season where the No. 18 team lacked consistency and Busch, despite having four wins during the regular season, missed the Playoffs. Dave Rogers took over as crew chief for the No. 18 team, a position he held through the 2014 season. Addington would move on to Team Penske, where he guided Kurt Busch’s team for the next two seasons (2010-11), then to Stewart-Haas Racing (2012-13) to crew chief Tony Stewart’s team. All three drivers have won Cup championships, something that doesn’t surprise Addington, he says, because all three shared a similar defining characteristic. Busch’s first NASCAR national series victory of any kind occurred in 2004, during his rookie season in the Xfinity Series. It came at Richmond Raceway in a race he dominated by leading 236 of a possible 250 laps and against a field that included the likes of Kevin Harvick, Martin Truex Jr., Greg Biffle and Kasey Kahne. That win would be the first of five Busch recorded that year. He would go on to win 93 more Xfinity races (and counting), the most all-time in that division. Busch surpassed Mark Martin’s previous record of 49 career wins when he won the 2011 night race at Bristol Motor Speedway. Jason Ratcliff was Busch’s crew chief that night. He and Busch would team for 33 Xfinity wins across parts of four seasons, including a series-record 13 victories in 2010. What Ratcliff remembers from his time with Busch was the desire he had for winning even in a series that wasn’t his primary focus. There have never been questions about Busch’s ability behind the wheel. From the time he entered NASCAR he always was regarded as a transcendent talent. For many years, however, there were lingering questions about whether he possessed the other qualities needed to become a championship-winning driver at NASCAR’s top level. A lack of consistency and perpetually struggling in the Playoffs had marked Busch’s stint at JGR since he had joined the team in 2008. Most every driver has a passion to win, but it is different with Kyle. 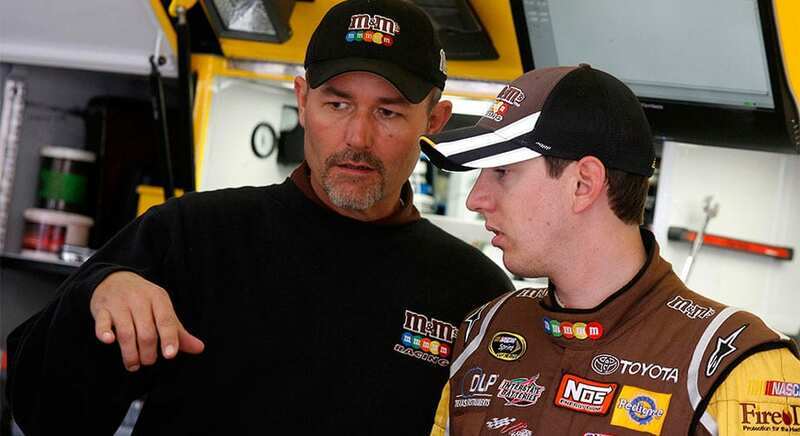 JGR appointed Adam Stevens to be Busch’s crew chief for the 2015 season, the third person to hold that position full time since Busch had signed with the organization seven years before. Stevens had served in the same capacity for Busch in the Xfinity Series for two years where the two won 19 of the 56 races they had teamed together. JGR executives figured that relationship would be a boon to Busch as he entered his 11th full-time Cup season, the missing ingredient to winning that elusive championship. Stevens’ tenure as Busch’s crew chief initially encountered some trials and tribulations in the form of Busch suffering a broken right leg and left foot in a crash during the Xfinity Series season-opener at Daytona International Speedway. The injuries sidelined Busch for the first 11 Cup races, forcing the first-year crew chief to essentially acclimate himself to Cup on the fly while working with three different drivers. Committing to a rigorous program allowed Busch — who also became a father for the first time in 2015 when wife Samantha gave birth to son Brexton that May — to return sooner than expected. And due to their time together in the Xfinity Series, Busch and Stevens quickly affirmed JGR’s assessment that Stevens would be the person to fully maximize Busch’s talent. Busch would win in just his fifth start, then won three more times during the summer, and qualified for the Playoffs even though he missed those 11 races. Exhibiting a level of patience and maturity throughout the Playoffs he hadn’t always displayed previously, Busch would go on to win his first Monster Energy Series championship by outdueling Kevin Harvick in the title race. The championship underscored Busch’s evolution into a driver who still knew how to go fast, but also was a driver who knows when to pick his spots and settle for the best finish possible on days when his car may not equal his talent. The inconsistency that once pockmarked Busch’s career has disappeared, as he and Stevens have advanced to the Championship 4 Playoff round every season they’ve been together. 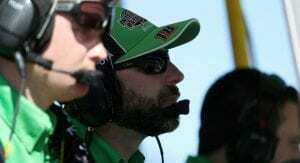 Unlike Gustafson, Addington, Ratcliff or Stevens, Rudy Fugle deals with a unique situation every time he serves as Busch’s crew chief. When Fugle and Busch team together, it is in the Gander Outdoors Truck Series, and Busch is driving a Toyota Tundra fielded by his own team, Kyle Busch Motorsports. Fugle’s position atop the pit box where he’s working not only with an elite talent but also his boss has afforded him a unique perspective to witness the maturation in Busch that others have seen. He never settles. He always wants more and more. The first time Fugle led a team where Busch was his driver came in 2013. 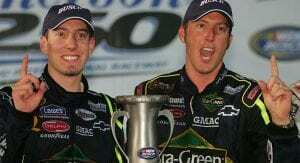 In the 10 races they worked together, Busch won five times. It would be six years before Fugle and Busch reunited. KBM tasked Fugle to groom Toyota developmental prospects Erik Jones, William Byron, Christopher Bell and Noah Gragson in full season efforts from 2015-2018. The Busch and Fugle reunification came this season, with their first race together last month at Atlanta Motor Speedway. Busch dominated en route to his 52nd career victory, a triumph that gave him sole possession of the all-time Truck Series win record he had shared with Ron Hornaday Jr. Busch added another victory a week later at Las Vegas Motor Speedway. The Atlanta and Las Vegas victories, like the others Busch has accumulated in the Xfinity and truck series in recent years, brought criticism on why he continues to compete in events outside of the Monster Energy NASCAR Cup Series. Don’t tell Fugle, however, that Busch shouldn’t be racing in every series he can.